Cyclone Promotions are pleased to announce that Aberdare’s Dorian Darch will take on Surrey’s undefeated heavyweight Nick Webb in an exciting eight-round contest at the Motorpoint Arena Cardiff on March 11, as part of the undercard for hometown boy Craig Kennedy’s vacant British cruiserweight title fight with Blackpool’s dangerous Matty Askin. Also on the big Cardiff bill is Ebbw Vale’s unbeaten bantamweight contender Ashley Brace, who faces her biggest test yet as a pro when she takes on Hungary’s former two-time world title challenger Alexandra Vlajk over eight-rounds. Aberdare’s Dorian Darch, 12 – 4, is currently on a four fight, three year winning streak, including an impressive points victory over Sheffield’s David Howe last time out. Darch has been in with some of the UK’s top heavyweights including current IBF king Anthony Joshua and soon to be WBO world title challenger Hughie Fury. In Nick Webb he faces yet another unbeaten prospect who is looking to make waves in the UK heavyweight scene. Surrey’s Webb has been in explosive form since turning professional with renowned fight figure Scott Welch in 2015. The unbeaten Webb’s record stands at 10 – 0, with nine of those victories coming via knockout, including six first-round stoppages. 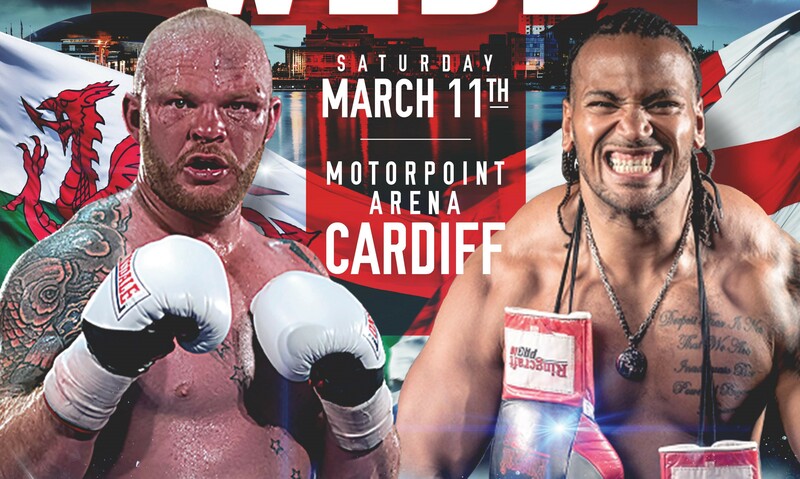 Darch represents a considerable step up in class for Webb on March 11, with the twenty-nine year old prospect looking to impress in front of the live Spike UK television cameras in Cardiff. Ebbw Vale’s talented Ashley Brace, 5 – 0, is fast becoming one of the hottest prospects in European female boxing and on March 11 she will face an experienced opponent in Hungary’s Alexandra Vlajk, 10 – 5. Budapest’s Vlajk is a former two-time world title challenger who is currently ranked #10 at bantamweight by the IBF. Brace will have to be at her best in this scheduled 8×2 mins bantamweight contest if she is to secure the victory and push on for an EBU bantamweight title challenge later in the year. Also featuring on the stacked Cardiff bill will be Aberdare’s undefeated Morgan Jones, 9(3) – 0, who takes a big step up in class against Libya’s undefeated Malik Zinad, 8(7) – 0, in an international 8×3 mins light heavyweight contest. This clash of stylish undefeated prospects will also feature on the live Spike UK undercard broadcast on March 11. Local talent on the big Kennedy vs Askin undercard includes Cardiff’s undefeated 2014 Commonwealth Games bronze medalist Nathan ‘Thunder’ Thorley, as well as Barry’s popular pair Jason Sillett and Jonathan O’Kelly. More undercard announcements will follow in the coming days. Doors will open at 4pm at the Motorpoint Arena, Cardiff on Saturday March 11, with boxing commencing at 4.30pm.